Best Fly Tying Vise – The Top Fly Tying Vise of 2019! Fly tying is the act of fabricating homemade flies by sewing together a variety of materials onto different sizes of fishing hooks. Fly fishing anglers commonly use these artificial flies when catching certain types of fish, and it isn’t unusual to find the avid angler wearing his fly hooks on his hat. Some people enjoy creating these fabricated insects as a hobby, while others prefer to assemble their own flies on location Knowing where you want to form your creations and what size hooks you want to use is the first step to take when choosing the best fly tying vise for you. Many come with a pedestal so that you can perform the task anyplace, and others come with a C-Clamp that may cause limitations in your use. No matter which hand you work with, you can find a vise that will graciously assist you, and one that rotates will always help to make your job easy. 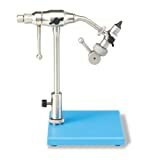 The following list on the best fly tying vise was established to help you decide which fly tying vise will best suit your needs. This versatile vise makes learning the trick of fly tying a breeze! Wolff Industries designed this quality vise with a stainless-steel construction and hardened steel jaws that will hold hooks ranging from sizes 32 to 6/0. Inspect your work and trim the fly simply by rotating the jaw with the convenient full line rotary system. This solid vise comes with a pedestal but it also includes a C-Clamp for added versatility. It is small enough to take with you on your fishing trips, and it includes three spools of thread along with a lifetime warranty. Add the exceptional rating and the moderate price, and you have the perfect vise. This sturdy vise delivers great performance and it provides you with everything you expect in a quality device. The strong jaws of this vise will accommodate a variety of hook sizes from 32 to 7/0, and it conveniently rotates for easy inspection. It doesn’t matter if you are a right handed or left handed, this vise will graciously convert to meet your needs. Although it doesn’t come with a bobbin cradle, it does include both a C-Clamp and a heavy-duty pedestal base. Fly tying couldn’t be as easy without this handy vise at your side! The Odyssey Fly Tying vise is a true 360 degree rotating vise that come with a c-clamp and bobbin cradle. Another great product from Griffin is this entry level odyssey spider fly tying vise. This 360-degree rotating vise features a generous jaw capacity with the ability to hold 28 to 4/0 size hooks. The vise will attach firmly to any table or workbench using the C-Clamp, and a bobbin cradle is thoughtfully added to this one for convenience. Griffin makes this vise completely in the USA and they even attach a lifetime warranty. With a good rating and an affordable price, what more could you ask for in a quality fly tying vise? The portability of this Griffin Superior vise allows for easy transport, or set it up at a table in a small area. This tying vise will simply adjust to accommodate hook sizes from 24 to 6/0, and the jaws will set to any angle. It does not offer a platform pedestal but it does come with a strong C-Clamp so you can attach it easily to any work table. One of the best features on this vise is the capability of conversion for right or left handed use. The 3/8-inch stem will conveniently collapse when you are finished using it so you can easily stow it away on the boat. This vise is perfect for the one who is just getting started. 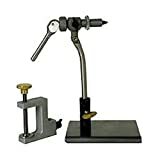 Now that you have had the opportunity to examine this list, you should have better knowledge in knowing which vise is the best fly tying vise for you. If you have any questions about the best fly tying vise, leave a comment below.